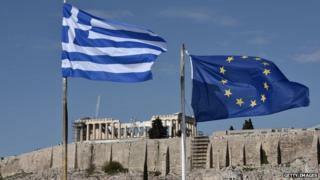 Greece belongs in the eurozone and the single currency depends on there being no "Grexit", the EU economic and financial affairs commissioner says. Pierre Moscovici told the BBC's Hardtalk "we will do everything" to prevent Greece leaving the eurozone. But he said the Greek government had to respect previous commitments. The new finance minister has meanwhile said he will not negotiate bailout terms with the "troika" - the global institutions overseeing Greek debt. The left-wing Syriza party won last weekend's election on an anti-austerity platform, promising to have half of Greece's debt written off, and to roll back on deep cuts to jobs, pay and pensions. "We believe that the place of Greece is in the eurozone, the euro needs Greece and that Greece needs and wants to be in the eurozone," Mr Moscovici, a former French finance minster, said. Image caption Mr Moscovici says "the place of Greece is in the eurozone"
He added: "We feel that it's very important for the stability of the eurozone and for the credibility of the euro that there is no 'Grexit'. This is why we will do everything that is needed to avoid it." But the commissioner said that while Europe had to respect the will of the Greek people in the election result, the commitments made by the previous Greek government also had to be taken into account. "We must address these issues in a quiet, peaceful and serene way. This [new] government has to say exactly what it intends to do," Mr Moscovici said. After meeting with the head of the Eurogroup - the finance ministers of the 19 EU states that have the euro as their currency - the new Greek finance minister said he would not work with the troika - the European Commission, European Central Bank and International Monetary Fund. Yanis Varoufakis called it "a committee built on rotten foundations". Media captionGreek Finance Minister Yanis Varoufakis: "We are not prepared to carry on pretending and trying to enforce an unenforceable programme"
He said he was instead seeking "fruitful negotiations" with individual troika members and EU nations. "We are not prepared to carry on pretending and extending, trying to enforce an unenforceable programme which for five years now has steadfastly refused to produce any tangible benefits," Mr Varoufakis told the BBC's Newsnight programme. "The disease that we're facing in Greece at the moment is that a problem of insolvency for five years has been dealt with as a problem of liquidity." The head of the Eurogroup, Jeroen Dijsselbloem, said that Greece should stick to its reform commitments. Mr Dijsselbloem said Greece and the Eurogroup had a "mutual interest in the further recovery of the Greek economy inside the eurozone" and warned against Athens acting unilaterally in its efforts to renegotiate its bailout. In an interview with the Hamburger Abendblatt newspaper on Saturday, German Chancellor Angela Merkel said she did "not envisage fresh debt cancellation" for Greece as banks and private creditors had already made substantial cuts. But she said she wanted Greece to "remain permanently part of the euro community". Greece has endured tough budget cuts in return for its €240bn (£179bn; $270bn) bailout, agreed in 2010 with the troika. The current programme of loans ends on 28 February. There are still €1.8bn of funds that could be disbursed to Greece if it meets the troika's conditions. Mr Moscovici also said the rise of anti-EU parties across Europe posed a threat to the union. "If Europe doesn't deliver on growth and jobs, if Europe is seen as the place for austerity, if Europe is not seen as a hope, as progress but as a constraint, as a punishment, as a pain, then the European project will be not only criticised but rejected. "This is why this Commission calls itself the Commission of the last chance." The full interview with Mr Moscovici can be seen on BBC World News on Monday 2 February at 0430, 0930, 1630 and 2130 GMT.